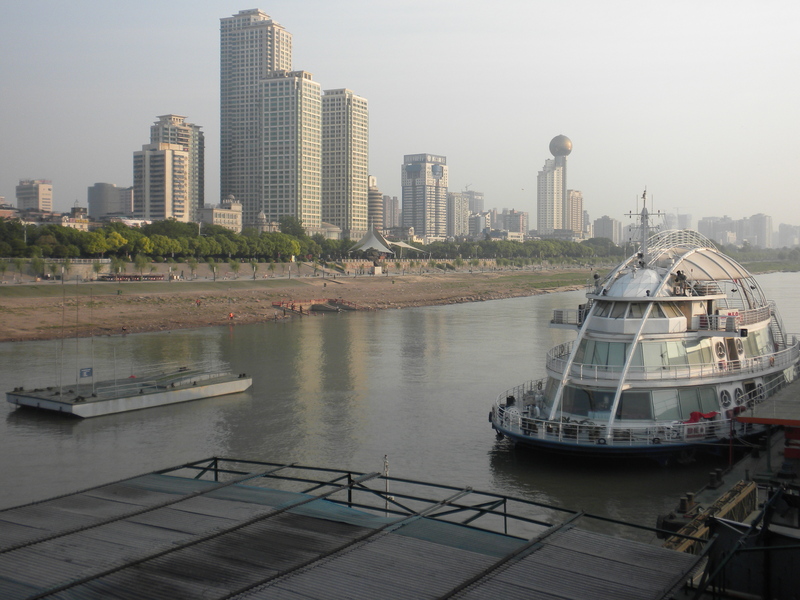 This morning we arrived in Wuhan, capital of Hubei Province, and said farewell to the Viking Emerald. 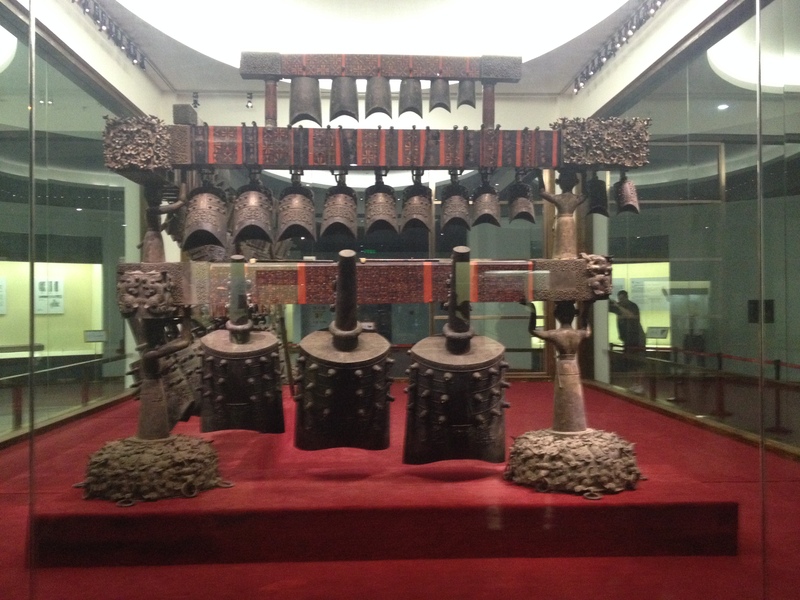 Before boarding our flight to Shanghai, we visited the Hubei Provincial Museum, one of the best-known museums in China. After the museum, it was off to Shanghai, our final stop in China. Our flight was late, of course. None of our flights in China were on time, though it did not appear to be the airlines’ fault. We would board our plane and then be told that air traffic control had told the pilot we had to wait to take off. My sense was that the Chinese air system is overtaxed by the number of flights, another problem for a country with 1.4 billion people. On our way in from the airport, we saw the Maglev train. The train has no wheels and operates on magnetic levitation (hence the name). It has a maximum speed of more than 268 miles an hour and makes the journey from the airport to the outskirts of Shanghai in seven minutes. Our bus took an hour, which made me wonder why we didn’t take the train. Shanghai skyscrapers at night, seen from the Bund. The mural is made of living flowers. Shanghai is variously called the New York of China or the Paris of the East. It is a modern city, with numerous skyscrapers, including the new Shanghai Tower, the second tallest building in the world (after the Burj Khalifa, in Dubai). It is also very Western, the result of having been the first Chinese city, other than Hong Kong, to have been opened to the West. At one time, nations such as Britain, France, and the United States had “concessions” in Shanghai that they controlled. The French concession remains a popular tourist destination. 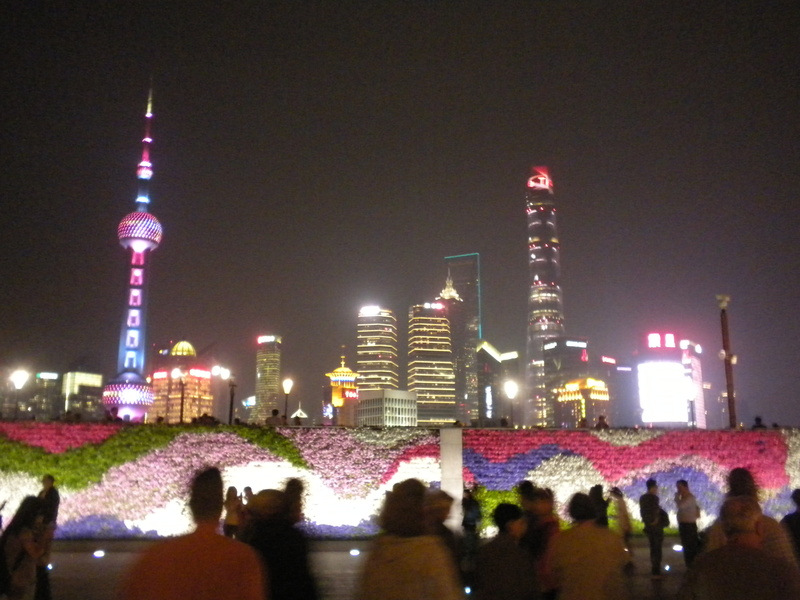 With 14 million people, Shanghai is larger than Beijing but more compact geographically. Even so, while the traffic was dense, it did not seem as bad as Beijing’s. Matthew said this was partly because, in order to have a car in Shanghai, you must first get a license. Licenses cost $17,000 and are handed out by lot, so people with cars are both wealthy and fortunate. After dinner, Matthew took us for a walk on the Bund, a riverside promenade that was adjacent to our hotel. A stroll on the Bund shows the two sides of Shanghai. Across the Huangpu River is the modern Shanghai, in the section known as Pudong (east bank), with skyscrapers like the Shanghai Tower and the Shanghai World Financial Center, which looks sort of like a can opener. On our side of the river, in Puxi (west bank, pronounced poo-shee) are older, more classic buildings, many of them constructed during the Western occupation of Shanghai in the 19th century. 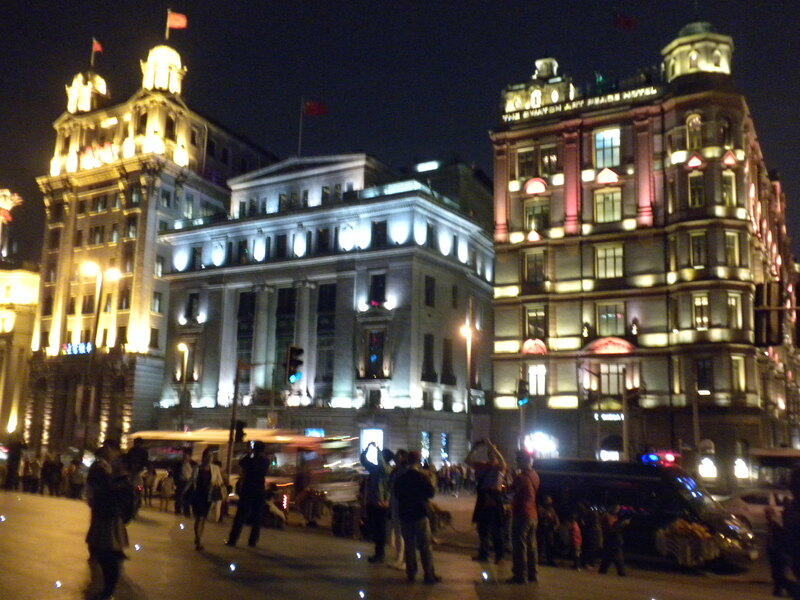 The Bund was jammed with people, even though it was only Monday. 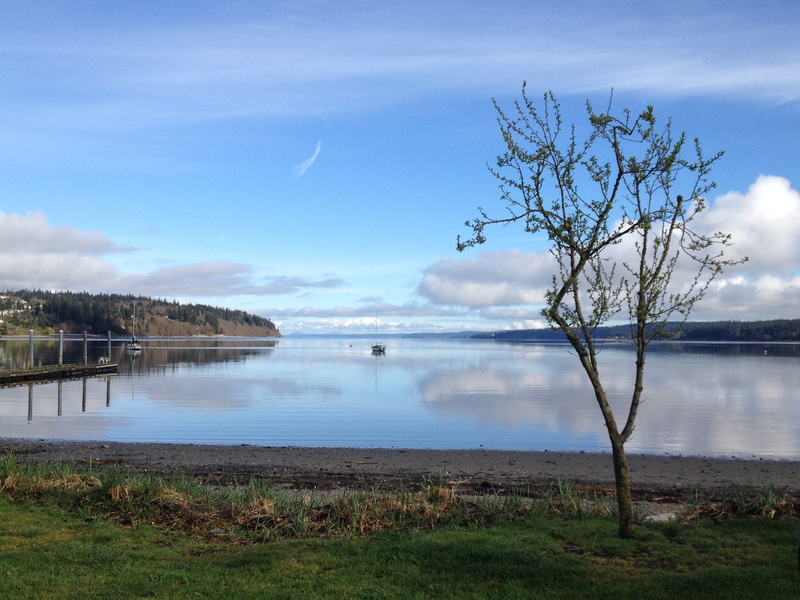 The crowds would grow throughout the week as May Day approached. Tomorrow we get a closer look at Shanghai.